18-12-2018 – “Act Five” of the Gilet Jaunes (Yellow Vest) demonstrations continued across France this past weekend. While the numbers were down compared to round four the week before – perhaps due to police violence against the demonstrators, tens of thousands across France again rallied in the face of the armed fist of the state. 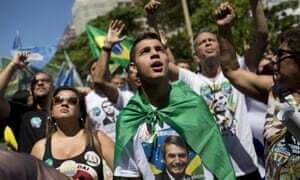 Some reports say that 3 000 rallied in Paris, while there were 66 000 across the country – compared with 125 000 a week ago. In typical French fashion, anti-government protests, when they erupt, continue for weeks on end. Whether it can keep its momentum remains to be seen. The brave protestors have already won one of their main demands – the abolition of the fuel tax increase on petrol and diesel, which had been imposed by the government as a “green tax”. At the same time, French President Emmanuel Macron refused to abolish the scrapping of a “wealth tax”, which has earnt him derision as the “president for the rich”. If the Yellow Vest movement continues across France, and inspires similar actions across Europe, the French President will struggle to retain his post. 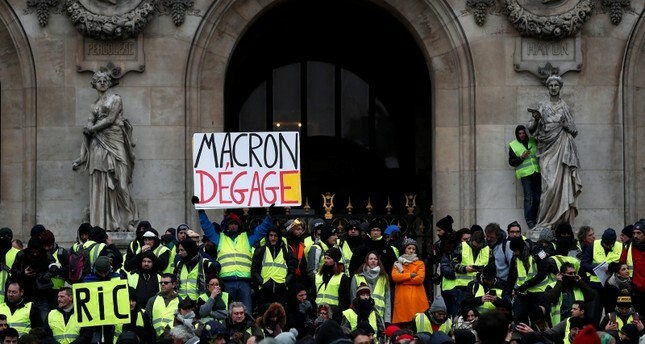 Yet the Yellow Vest movement is not just about President Macron, and not just about a concern about high fuel prices. The leaderless movement has nonetheless circulated a list of demands, with the vast majority about the high cost of living, heavy workloads for little or no gain, and general unease about an unjust order which favours the rich at the expense of the poor and the “middle class”. In other words, the Yellow Vest rebellion is an uprising against capitalism, but without saying so openly. The lack of pro-working class leadership somewhat restricts the goals of the movement, but at the same time this distance from the official “left” is what has allowed its launch and growth so far. From a distance it seems that in France, like Australia, what passes for the left is seen as too reformist, and the Union bureaucracy too concerned for the contents of their own pockets. In such conditions, revolt against neo-conservative government rule, had to take place outside of the “left”. Some have claimed that amongst the Yellow Vests are right-wing or even fascist elements, attempting to drive it down their avenues. While the Yellow Vests have so far eschewed association with any political party or movement, left or right, the direction so far is much more left wing insofar as it is demonstrating against the immense inequality of a profits first system. Moreover, it possibly portends even a revolution to redress these rightful grievances, and many others, built up over several decades. It is a revolt against the elite which is not only enriching itself at the expense of the poor, but threatening the very existence of human civilisation. In addition, in stark contrast to the right-wing populism which has perhaps understandably produced Brexit in the United Kingdom, Trump in the US, and Bolsonaro in Brazil, the Yellow Vests do not have an anti-immigrant or a racist anti-European Union (EU) position per se. In fact, the Yellow Vest’s stance towards the EU does call for a “Frexit” – a pull-out from the EU. According to some demands which have been circulating in their name, the Frexit is called for to “regain economic, monetary and political sovereignty”. Here there is perhaps a lack of class awareness, for if France was to exit the EU, French workers would still be subject to the oppression of “their own” ruling class. Nevertheless, the content does not indicate the arrant racism which compelled some Britons to vote for Brexit. The EU is an imperialist trading bloc, which seeks to drive down the living and working conditions of all European workers to benefit the wealthiest European ruling classes, particularly the French and German. Workers need a left-wing opposition to the EU, which the Yellow Vests provide. Perhaps the most progressive Yellow Vest demand of all is the call for France to cease its participation in foreign wars of aggression, and for an exit from NATO (North Atlantic Treaty Organisation). French imperialism took part in arguably the dirtiest war in history – the arming and funding of terrorist death squads to overthrow the Syrian Arab Republic from 2011 to 2018. Much of what passes for the “left” internationally backed this atrocious war of regime change against Syria, so in this sense alone the Yellow Vests are leagues ahead of liberal war-mongering. As for NATO, it is no exaggeration to say that it is threatening the world with global nuclear war. NATO was always an imperialist anti-Russian pact, whether in the form of the former Soviet Union, or modern Russia. Driven by the US Empire, it is an imperialist alliance pushing humanity to the brink of a catastrophic war. The Yellow Vest demand for a French exit from NATO fills part of the anti-war gap which flowed from the liberal non-opposition to the NATO wars against Libya and Syria. This should be complemented by similar demands to leave NATO by workers in NATO countries, and demands internationally for its abolition. Similarly, the Yellow Vest demand for the repatriation of all French soldiers from “Francafique” – former French colonies in Africa, to cease interfering in the African countries, and for equal relations between them and France, is virtually a demand for the final end of French colonialism. Algeria was only the most well-known French African colony, after its battles for independence. But “Francafique” includes Mali, Senegal, Guinea, Benin, Morocco, Ivory Coast, Mauritania, Gambia, Chad and Cameroon. Direct military occupation by France is not entirely a thing of the past, to which the Yellow Vests draw attention. The Yellow Vests were criticised in some quarters for ignoring environmental issues such as global warming, given that their central demand (which they subsequently won) was for the abolition of a fuel tax increase. But in fact, the Yellow Vests were well aware of the acute danger of climate disruption and agreed that measures must be taken to deal with it. Their only precondition was that the poor, working class and sections of the middle class should not be made to pay for it – while the rich elite get off scot-free. In Australia, while there was no open revolt on the streets, many people rejected the former Labor Party federal government’s “carbon tax” for similar reasons – despite right-wingers also opposing it on the basis of climate denial. The Yellow Vest manifesto does contain significant pro-environment measures. For example, it calls for a ban on the production of plastic bottles, a call to weaken the power of Big Pharma (large scale pharmaceutical companies), and demands a ban on GMO (Genetically Modified Organism) crops, carcinogenic (cancer causing) pesticides, endocrine disruptors (cancer causing chemicals) and monocrops (the large scale growing of one crop over vast fields). It should be recognised that under a socialist system, with the profit motive absent, GMOs could potentially be used to increase crop yield to feed more people. Under private production for private profit, however, GMOs in the hands of corporate agribusiness contain critical danger. The Yellow Vests are on point here, as was the President of Syria – a target of imperialism, when he banned the use of GMOs in that country in 2012. Perhaps the most remarkable environmental demand of the Yellow Vests is the call for all products to be made to last 10 years, and for spare parts to be available for them during that time. They explicitly call for the end of “planned obsolescence” – a hallmark of late capitalism. “Planned obsolescence” is of course where the manufacturing corporations deliberately manufacture products with a short lifespan, sometimes as little as 12 months. At a certain point, capital realised that making good quality products which had a long life span actually prevented the masses from purchasing new ones. Thus the “throw away” society was born, with people more or less encouraged to dispose of old things rather than have them repaired. And indeed, repairs became uneconomical or even impossible to come by. The throw-away society is just one aspect of the inherently anti-environmental practice of the profit system. The Yellow Vest manifesto contains significant demands for the welfare and well-being of the masses. For example, it calls for an increase of 40% of the basic pension and social welfare. It calls for an increase in hiring in the public sector to re-establish public services. It demands a public housing program to house the 5 million homeless, and severe penalties for mayors that leave people on the streets. This is recognition of how the capitalist system has abandoned and turned against the working class over the last 30 years. This drive is often referred to as “neoliberalism”, but this is a misnomer. “Neoliberalism” is not a policy choice, but the current phase of capitalism. From their perspective, the crisis in the rate of the profitability of capital has driven demands to release whole areas where previously the state organised and ran public services. Education, public housing, healthcare, legal aid, public transport, infrastructure – all of these areas and more had previously been undertaken by the capitalist state in order to assure the profitability of private capital. It did this by running sections of the economy where the capitalists could not obtain an adequate rate of return, and thus had no interest. Now, capital no longer makes an adequate profit from the industries it traditionally invested in. This is the basic reason for the relentless wave of privatisation. Despite the progressive overall direction of the Yellow Vest manifesto, at the same time it contains demands which aid the oppressive system they rebel against. For example, it calls for the “prevention of migratory flows which cannot be accommodated or integrated”. This does not come across as an extreme anti-immigration position, but appears to bend in that direction. Mass migration to Europe in recent times has largely come about due to the wars imperialism has waged in the Middle East and Northern Africa – a fact recognised by other Yellow Vest demands. Yet it is a dangerous path to go down to play into the central divide and rule tactic the ruling classes use against workers. Capital says to unwitting workers, your enemies are “foreigners” – not the obscenely rich corporations. It should be recognised that there are some issues with the large numbers of migrants flowing into Europe in some areas. Yet these issues are minor in comparison with the error of throwing in your lot with the elite classes, which is the inevitable result of falling for an anti-migrant line. In addition, the demand for the “quadrupling of the budget for law and order” could easily go in the opposite direction to that which is intended. The full demand does demand access to judicial procedures for all, which trends in a progressive direction. Under the rule of capital, the poor and working classes generally cannot afford to either defend a legal case, or bring one before a court of law. This is yet another injustice of the rule of finance capital. However, calling for a four-fold increase of the budget for law and order could very well mean four times the amount of riot police the Yellow Vests will face on the streets! The Yellow Vests appear to be somewhat unaware of the class nature of the capitalist state. The treacherous role of the Trade Union bureaucracy was displayed in a statement released by six Union confederations on December 6. It denounced “all forms of violence”, did not ask anyone to join the Yellow Vest demonstrations, and effectively called for “negotiations”. The conservative officials risk being seen as at one with the government itself, which again increases the risk of workers turning away from Unions altogether, into the hands of the far right. Despite the reformism of the hidebound Union officials, and despite the at times contradictory demands of the Yellow Vest manifesto, it is in the interests of workers internationally to join and/or come behind a general uprising against capitalist class rule. If a Marxist vanguard was to form, it could give crucial leadership to a movement which has thus far remained leaderless by necessity – given the reformism of the “left” and the conservatism of the Union officials. Clarity of the political role of capital and the role of the working class in fighting for its liberation is at a premium. The rule of the rich must end. Stop Adani Now – the Planet is Burning! 08-12-2018 – Queensland is literally on fire. 140 bushfires, some of which are described as “firestorms” have torched areas of Central Queensland this last fortnight. Some people who have evacuated have spent a week away from their homes, unable to return. The rabid intensity of these fires is a window to the dire portent of cataclysmic global warming which is only just beginning. Climate denialists no longer have an audience, if they ever did, in the face of chaotic and dangerous “weather” sweeping the globe. In the face of this reality, the obscenity of the Adani coal mine slated for the Galilee Basin is a stark reminder of the archaic political system which allows, and even encourages, its own destruction. In the face of coal mines being green lighted and Pacific Islands being swallowed up by the sea, last week saw a “School Strike 4 Climate” where primary and secondary students around the country walked out of school to protest the glaring lack of action by politicians. The Stop Adani campaign continues, following on from Adani’s recent claim that its mega coal mine will go ahead. It will apparently now be self-funded, after a string of domestic and international banks refused to provide finance. All of the urgent student actions and all of the actions against the Adani monstrosity need to continue. They are desperately needed and allow those most aware of potentially civilisation ending ecological collapse to step into activism. At the same time, the political leadership of the official Stop Adani campaign and the School Strike for Climate steer the actions on a course which is 180 degrees in the wrong direction. They seek to simply lobby the very politicians who know very well who they are serving, which is certainly not “the people” or those without wealth. These politicians are “not listening” because they are trained operatives defending that which produced Adani – the capitalist system of production for private profit. The parliament itself is set up as a foil for working people – it sustains the massive illusion that there are representative bodies that are responsive to their needs. The official Stop Adani campaign is focusing on lobbying the Labor Party, especially in the lead up to the coming federal election. The Labor Party (ALP) is as committed to capitalist environmental desecration as the profit-gouging corporations themselves. If the Labor Party wanted to, it could Stop Adani tomorrow, as it holds government in Queensland. Instead, federal ALP leader Bill Shorten recently stated that the Adani coal mine would not affect carbon emissions !! It should be clear that the Labor Party is prepared to lose an election rather than oppose the Adani coal mine. This highlights the futility of not only lobbying the ALP, but the parliament and every pillar of the rule of capital. To really stop Adani, the political leadership of the campaign will have to break with the entire apparatus of the system. Yet breaking with the system is not the intention of the political leadership of the Stop Adani campaign, and the campaign against global warming in general. On the contrary, their intention is to drive working people back towards the system, towards parliament, towards “our politicians”. This is the deadliest illusion of them all. Politicians who are paid apparatchiks of the rule of the banks are not “ours” in the slightest way. They are hired guns of an alien class – the elite billionaires whose wealth accumulates on the backs of the labour of workers. There may be some politicians who, in words, sound more liberal, and more progressive than others. Yet they are just as much guns for hire as conservatives. There are a myriad of NGOs (Non-Government Organisations) who are very well funded, whose prime aim is to steer the Stop Adani and climate change movements back towards the supposedly liberal politicians, into parliament, and indeed, right back into the very source of environmental destruction – capitalism itself. This appears as a contradiction only to those who have yet to side with the workers in their struggle for emancipation. Stop Adani, the Australian Youth Climate Coalition (AYCC), SEED (a branch of AYCC), 350.org, the Australian Conservation Foundation (ACF) and GetUp! are the primary NGOs who bend over backwards to limit the campaign to stop Adani within the strict bounds of appealing to corporate Australia, and the parliament as its puppet, to “be reasonable”. But there is no reasoning with those who build their careers and accumulate obscene profits at the expense of the lives of workers. The idea that socialism in power can counteract dangerous climate change is anathema to liberal minded NGOs. Yet this is precisely what is happening in the People’s Republic of China (PRC). In the PRC, working class power arrived with the victory of the 1949 revolution. There have been many changes since that time, but today the PRC government is the major power in the world which is making serious efforts to counteract fast approaching global warming. The PRC is phasing out coal, implementing electric bus transport in cities, and heavily investing in solar and wind power. For serious efforts to move away from coal, however, the PRC is now the fastest expanding nuclear power producer. Rather than the fantasy of “100% renewable energy”, what is required is the correct mix of all zero carbon energy sources. That is, perhaps until nuclear fusion is developed, at which point all other zero carbon energy sources will probably be eclipsed. And, lo and behold, it is the PRC which is leading the way here also. While China’s socialism is far from perfect, the graphic lesson is that only a workers’ state can take resolute measures towards holding humanity back from the abyss of climate catastrophe. 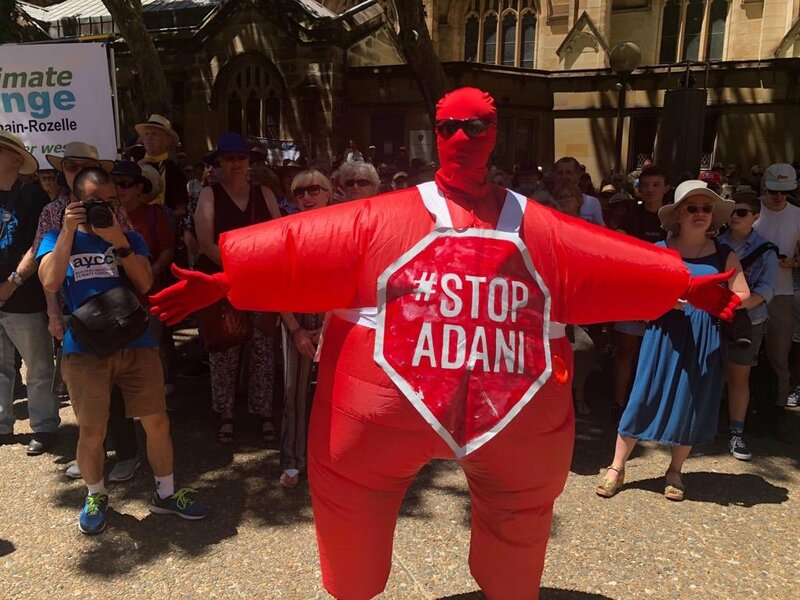 Rather than a fool’s gallery of elite politicians and their plush parliaments, the Stop Adani campaign must look to working people and its potential collective power to stop both coal and capitalism in its tracks. 02-12-2018 – In a world which was not upside down, open military provocations against a neighbouring country which threaten catastrophic war near the European landmass would be universally condemned. When the targeted country happens to be Russia, however, any provocation, however hostile, is justified. Defying basic logic, such taunting can even be twisted to be presented as a “Russian attack”. Such is the world of the Western corporate media, official mouthpieces for the behemoth of US imperialism. What actually occurred was an open and reckless provocation by the Kiev based Ukrainian government against Russia, acting as a cat’s paw for US/EU/NATO imperialism. 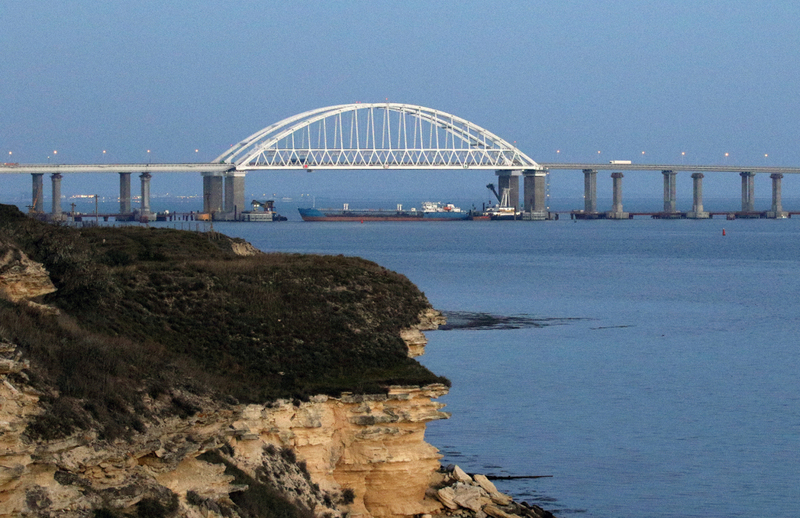 Three ships were ordered to deliberately enter Russian territorial waters by crossing the Kerch Strait, without the required notification to Russian maritime authorities. How do we know this? Because the Ukrainian sailors have already admitted as such. Not only that, the Ukrainian Security Service (SBU), have also admitted that it had two agents aboard the Ukrainian naval ships which were detained by Russia for ignoring warnings to cease their dangerous manoeuvres. Throwing away even a semblance of an independent mask, Ukrainian President Petro Poroshenko then publicly appealed for NATO ships to patrol the Sea of Azov to “provide security”. Continuing the charade, Poroshenko then declared martial law – inside Ukraine – supposedly to deter hostile acts from Russia. As others have pointed out, declaring martial law within Ukraine, for something that happened out at sea, is highly suspicious. Yet more dubious actions have followed. On November 30, Poroshenko banned Russian males between the ages of 16 and 60 from entering Ukraine. He claimed that this was to prevent Russians forming private armies which, he claimed, act as directed by the Russian Federation. He outrageously claimed that these “armies” aim to finish what started in 2014. Working people need to be clear. What actually occurred in 2014 in Ukraine was a US/EU/NATO backed fascist coup against an elected government. It was this fascist coup in February 2014 which brought Poroshenko and his cronies into “government”. While the Poroshenko government just barely stops short of being an organised fascist movement, his government relies on support from literal pro-Nazi Ukrainian fascists who are viscerally anti-Russian, anti-socialist and pro-US. In response to this fascist backed coup, Ukrainian areas in the East bravely declared independence in opposition to the Kiev based fascist coup government. They formed the Donetsk People’s Republic and the Lugansk People’s Republic. Given their refusal to submit to NATO armed fascism, they deserve the support of workers worldwide. Ever since 2014, the Western corporate press has repeated a falsehood over and over and over again – that Russia “annexed” Crimea. Such language harks back to pre-World War I rhetoric, and provides an ominous presage to World War III. What occurred was that Crimeans voted by an undisputable majority – over 95% – to secede from Ukraine and to join the Russian Federation. Crimea is overwhelmingly ethnically and linguistically Russian, but even that was only part of the reason why a reunion with Russia was the almost universal choice. Crimeans voted to join Russia because the alternative was to live under the rule of NATO armed fascists. Barely a word of this essential truth ever appears in the corporate media of the US Empire and its vassal states. No amount of desperate fairy-tale retelling of events by Washington, London, Paris and Canberra can unmake this fact. For the imperialists, war is the only way out of the economic and political crisis which is almost entirely of their own making. The collapse of “free enterprise” capitalism in the US, Europe, Japan and Australia, and the subsequent vicious attacks on the workers which result, means that the Western elites must have a scapegoat and a target, lest they face open revolt at home. Russia is the easy target, what with a century of anti-Soviet propaganda already hammered into the psyche of a suffering Western working class. Hence, Russophobia makes a dramatic return, and is then ramped up to hysterical levels. As we have mentioned previously, the Russophobia of today contains a combination of racism and anti-communism, even despite the overthrow of socialism in the former Union of Soviet Socialist Republics (USSR) in 1991-2. This is why it is in the vital interests of the word’s workers to defend Russia against US imperialism, despite the capitalism restored in Russia since that time. This is why also it was necessary to stand by Russia as it effectively defeated the ISIS mercenary death squads in Syria. In fact, the US led war for regime change in Syria was in part a proxy war against Russia. In the same way, the NATO backing of fascists in Ukraine is in some ways an even larger proxy war against neighbouring Russia. While the foreign policy of the Russian state can sometimes be highly questionable, e.g. maintaining good relations with dubious states such as Israel and Saudi Arabia, at the same time the Russian state is one of the only entities which is currently preventing Wall Street from launching a catastrophic war which could potentially incinerate hundreds of millions of people. In fact, Russia today effectively takes on the responsibility – which it did not ask for – of holding the US/EU/NATO juggernaut in check. The Russian state today, with its strategic military strength, will need to be a temporary ally in the struggle for socialism of the world’s working people, insofar as it acts to stay the hand of a marauding and dangerous US imperialism. At the same time, pro-socialist workers within Russia need to recruit to their own banner, in the course of linking with other pro-working class forces internationally, in the struggle to prevent the US Empire from launching World War III. Australian left parties especially, need to utterly reject all facets of Russophobia, and act to combat its dissemination amongst working people. 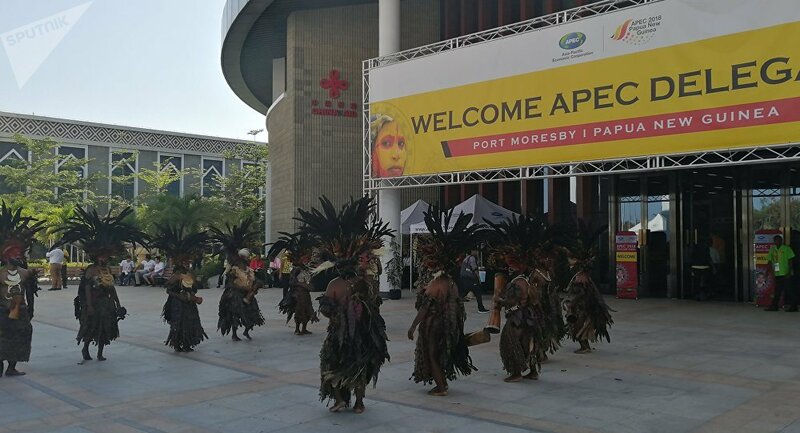 24-11-2018 – Asia Pacific Economic Co-Operation (APEC) meetings are usually straight forward affairs, full of feel good rhetoric about “free” trade and co-operation. This year it is a different story, with no traditional joint communique able to be cobbled together amongst the 21 member states. The corporate media offer the vapid analysis that this was due to tensions between the governments of the United States of America (US) and the People’s Republic of China (PRC). In reality, this year’s APEC summit was one in which the US rulers threatened, yet again, to launch a catastrophic war against Red China. If triggered, such a war could annihilate millions of innocent human beings. As usual, Washington is backed to the hilt by vassal Canberra politicians, recklessly endangering the entire Asia-Pacific. Australian Prime Minister Scott Morrison announced the development of the Lombrum naval base, along with the US military at the APEC summit. The Lombrum naval base is on Manus Island, and has not been used as a US base since World War II. The Manus Island Papua New Guinea (PNG) governor, Charlie Benjamin, stated that the naval base is only in the interests of the US and Australia, not PNG locals. It is the cruelest of ironies, that the base could be expanded on Manus Island, which the Australian government has made notorious by using it as a location for the inhuman torture of refugees and those seeking a safe place to live. To be both a base for the illegal and unjust detention of innocents, as well as a staging post for the potential launching of US led imperialist war, condemns the systems which allow it. The Australian ruling class has already allowed the US to use Darwin as a rotating training ground for thousands of its marines, but Manus Island would be a beach head significantly closer to their target – mainland China. The language from PRC President Xi Jinping was conciliatory and offered cautious warnings, whereas the language from US Vice President Mike Pence was almost inflammatory. President Xi defended the trillion dollar One Belt One Road (New Silk Road) infrastructure development project as one which has no hidden political agendas, and which targets no one. Vice President Pence, on the other hand, claimed that the US offers its partners no coercion, no drowning countries in a sea of debt, and no compromises on their independence. The US spokesperson retailed bald faced lies when referring obliquely to China’s mutual assistance projects it undertakes throughout Eurasia and the Asia-Pacific. The fact is that the US, mired in a capitalist economic crisis of its making, is not in a position to offer the development assistance that China’s huge state led economy can. The US rulers know that the longer they sit back, the more they will be overtaken by the PRC. Unable to countenance coming second to anyone, let alone an Asian country which 70 years ago was mired in Third World conditions, Washington’s only chance to prevent being overtaken is to launch a cataclysmic war – regardless of the costs. Mainstream media reports of China and the US refer to “rivalry” and “tensions” between two superpowers, where they sometimes admit that the US is past the peak of its power, whereas China is rising. What they cannot say is that China versus the US today is a case of socialism versus capitalism. Yes, the socialism in China is distorted, imperfect, and sometimes politically misled internally and internationally by the Communist Party of China (CPC). Despite this, China’s rapid advance over the last 30 years clearly demonstrates the superiority of the socialist mode of production, based predominantly on public ownership of the means of production, vis-à-vis the capitalist mode of production based on private ownership of the means of production by a tiny handful of obscenely wealthy elites, as in the West. While world capitalism entered the “Third Slump” in 2008 and has barely recovered, China’s economy powers along, outstripping the West even despite not being able to yet match Western labour productivity overall. China ended the “century of humiliation” at the hands of the colonial powers in 1949, with the final victory of its socialist revolution. Today, China’s stupendous economic growth is driven by the workers’ state which emerged out of this victory, in which hundreds of millions of workers and peasants overturned feudal and capitalist rule. In the PRC, the banks, transport infrastructure, telecommunications, electricity, shipping, defence industries, space industries, robotics, aircraft and train manufacturing, media, cinema and computer chip manufacturing, amongst other things, are all state owned or majority state owned. And they are all supervised and controlled by the government to ensure they stay within the limits of the five year plan. This has led to stunning breakthroughs by Chinese made technology, with, for example, China leading the way in the production of supercomputers, and being the first country to effect a soft landing on the dark side of the moon. The capitalist economies of the US, Europe, Japan and Australia, on the other hand, remain mired in effective recession. In Australia, wages in terms of purchasing power have never been lower in history. All governments routinely slash public spending on healthcare, education, public transport, pensions, aged care etc., and funnel it directly to the private sector. This has little effect, the rate of profit continues to fall, and working people suffer the consequences. Poverty and homelessness is skyrocketing in Australia and also the United Kingdom (UK). These governments then try to divert the backlash – onto China! Working people should not fear China but defend it, in the process of struggling to achieve socialism on these shores. Infrastructure development, decent public transport, banks which provide a low cost service, affordable housing, indeed – a better life – all this and more awaits if workers can prevent Washington and Canberra from launching a calamitous war in the Pacific. 20-11-2018 – The Australian labour movement has a long and proud history, which has won substantial gains for working people for over 100 years. Weekends, public holidays, four weeks annual leave, leave loading and many other basic working conditions were won through powerful and well organised Unions since the 1890s. But it is no secret that the Union movement has never been under greater attack than it is now. The capitalist financial crisis which began in 2008 has barely let up, resulting in the “captains of industry” pushing to remove hard won working conditions that many had taken for granted. The right of Union staff to enter workplaces to speak with workers is restricted and in some cases completely absent. Decent penalty rates – the right to be compensated for working weekends and public holidays – have been removed for hospitality workers, and if there is no fightback, will inevitably be removed from other industries one by one. Employers only need argue in a court which is already stacked in their favour, that there is little reason why they should pay them when other employers are not. The Australian Council of Trade Unions (ACTU) is currently pushing the “Change the Rules” campaign, with rallies taking place in many cities around the country throughout November. It is purported that this campaign aims to change the Industrial Relations (IR) laws, which now are heavily tilted in favour of employers, to IR laws which guarantee basic rights and entitlements for workers. But the “Change the Rules” campaign is a gigantic scam, a common ruse to elect the Australian Labor Party (ALP) to federal government. The ALP in government, however, from 2007 to 2013, barely changed the “Work Choices” legislation of the Howard Liberal government, putting in place an Orwellian named “Fair Work Australia”. The Australian Building and Construction Commission (ABCC) – a body designed almost wholly to take down the power of the building and construction Unions – remains. It has been joined by the Registered Organisations Commission (ROC) – a government body which has the power to de-register Unions, and even decide who can be an official of a Union. Needless to say, the ALP has given no undertaking that it will make any move whatsoever against these anti-Union arms of the state. The corporate employer class is already getting away with murder – in the case of the construction industry, sometimes literally. Unpaid overtime is widespread through several industries. Outright wage theft, where workers are being paid way below what they are legally entitled to, is rampant. In areas where there are different classifications and thus different pay levels, employers are often simply giving workers jobs which are above their classification, and expect them to be done without any extra pay. Health and Safety in many industries is regarded as a cost by employers, which can be ignored regardless of the dangers posed to workers, or even the public. Casualisation is now at unprecedented levels, with around 40% of the workforce in temporary or contract employment. Not only does this mean casual staff have no right to any paid leave, they are almost powerless to demand basic workplace rights, due to the very real threat of being removed from the workplace at the drop of a hat. Wages themselves, are the lowest they have ever been in Australian history, in terms of purchasing power. The business and employing class clearly feel no compunction for blatantly breaking industrial laws, many of which were written for their benefit. In fact, many employers’ actions are lawless as a matter of routine, with reckless regard for the consequences. In response, the only chance workers and Unions have of winning back the rights that have been stripped, and holding the employers to account for the laws that they flagrantly breach, is to openly defy the laws which allow this to occur. This means taking strike action – whether or not the “rules” allow for this. If any worker or Union is taken into custody for taking strike action – then the strike in response must be expanded further and further. In fact, it will be necessary to strike for the right to take strike action. Almost all gains won by Unions in this country were won through the use of the strike weapon. No rules were ever changed by pleading with the rule writers to change them – and this is especially going to be the case for industrial laws. Standing as a clear obstacle to this perspective is the conservative Union bureaucracy, chock full of careerist Union officials – many of whom are actually members of the ALP. With a few exceptions, the Union officials, from the ACTU down to local Union secretaries, have a material interest in herding workers within the bounds of what is acceptable to the profit system. Thus they consciously attempt to imbue workers with an outlook which is in stark contrast to their basic needs. If the business class says that penalty rates must go, or livable wages must go, or basic health and safety conditions must go, or the right to permanent employment must go – then workers must respond by saying that if this is the case, it is capitalism itself which must go! This basic defence of working people is anathema to the Union officials, who are handsomely paid to shepherd workers behind the parliament, and/or, the Labor Party. The truth workers need to know is that, in fact, the IR “rules” are doing precisely what they are intended to do – to ensure the flow of obscene profits to private capital, in an era of profound international crisis for the capitalist system. The “rules” ensure that workers pay the price through the destruction of manufacturing, the privatisation of public services and the disappearance of secure employment. To turn this around, what is required are the building of rank and file networks throughout all Unions which exclude officials and paid Union staffers. Within these rank and file committees, class struggle militants and socialists need to push for a complete break with the Labor Party and all arms of the employers’ state – arbitration commissions, courts, parliaments, the lot. A class struggle leadership of the Unions would fight for a shorter working week with no loss in pay, for permanent jobs for all, and for Union control of hiring and training. This is bound up with efforts to forge a genuine workers party. Such a party would fight for a socialist order which abolishes the entire system of wage slavery via the rule of workers councils and public ownership of the major means of production. BREAK ANTI-UNION RULES! 27-10-2018 – It’s no secret. The US ruling class, through its various fronts, has attempted to overthrow the Venezuelan government repeatedly since Hugo Chavez swept to electoral power in 1998. There was a coup attempt in 2002, an attempt to shut down the state owned PDVSA oil company in 2003, a separatist plot in the Zulia region in 2008, and violent opposition led rolling street demonstrations in 2014 and 2017. This year on July 8, US President Donald Trump laid the military option on the table. According to Venezuela’s Foreign Minister Jorge Arreaza, Trump had a meeting with the then Secretary of State Rex Tillerson and then national security adviser HR McMaster, asking why the US could not “finish off” Venezuelan President Nicholas Maduro through a military operation. Apparently Tillerson and McMaster managed to talk Trump out of that option. Washington, however, continues to carry out everything but an actual military intervention to overthrow the Bolivarian Republic of Venezuela. While there is a substantial right-wing domestic opposition to the Venezuelan government, it would barely be able to sustain its multiple coup attempts without the financial and political backing of notorious US deep state operatives such as the National Endowment for Democracy (NED). The NED is more or less the public face of the CIA, which poses as an aid organisation, but in fact exists to subvert and/or overthrow any government or country around the world which is perceived to be too independent from Wall Street. In Venezuela, it partners with the US Agency for International Development (USAID), to funnel funding to the opposition which repeatedly refuses to accept the results of elections within Venezuela which they lose. In 2015 alone, the US pumped $4.2 million into Venezuela through the NED and USAID. The US government also funds the Broadcasting Board of Governors, to the tune of some $777.8 million. This money runs the “Voice of America” news service, which for decades has beamed anti-communist propaganda into Cuba, and continues to do so throughout Latin America and Asia. Yet it is not just faux media organisations which Washington funds and often creates. It is also entire opposition political parties. The NED, via the International Republican Institute (IRI), funds the right-wing coalition Democratic Unity Roundtable (MUD), in violation of Venezuelan law. The IRI has virtually set up the opposition parties Primero Justicia and Voluntad Popular. It is also no coincidence that these right-wing parties are heavily supported and backed by Venezuela’s wealthy and upper classes. For years, the majority of working class and poorer Venezuelans have stood by their “Bolivarian Revolution”. For around 15 years, the Chavista movement (or “Chavismo”, named after initiating President Hugo Chavez) was unassailable and virtually could not lose an election. 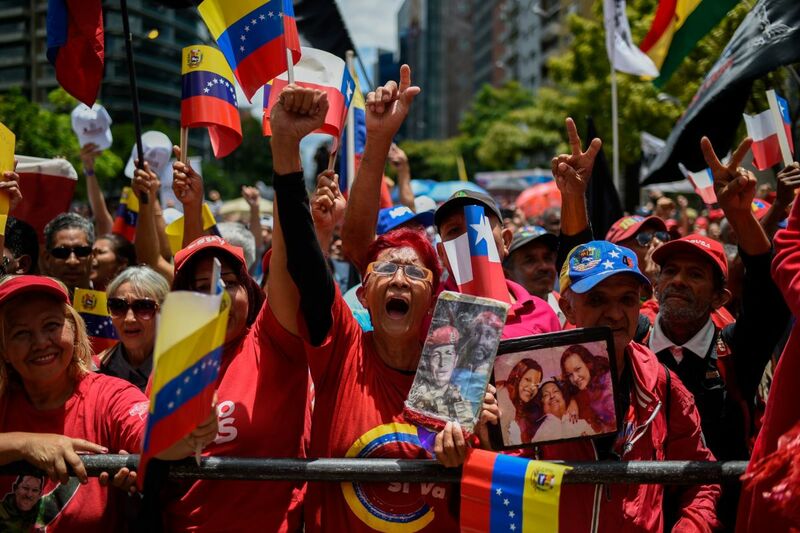 The Bolivarian Revolution, with the overwhelming support of the majority of Venezuelans who have little personal wealth, did win substantial gains that leftists the world over could celebrate. For the first time, many people who could not afford to get an education were able to enroll. The minimum wage was increased, by government decree, repeatedly. Free health care centres were set up in poorer neighbourhoods which had rarely seen a doctor. Housing was built for those who could least afford to buy. Venezuela’s substantial oil wealth helped to fund these progressive steps which had never previously been contemplated. Hugo Chavez and the Chavistas claimed they were for socialism, and that this was the aim of their revolution. Chavista supporters no doubt consciously accept socialism, yet in practice the Bolivarian Revolution was always based on reforming the capitalist system. Chavistas may deny it, but the Bolivarian Revolution did not take the crucial first steps towards socialism – the organisation of the working class in preparation for the seizure of state power. For this, what is indispensable is the forging of a Marxist vanguard party – composed of the most advanced pro-working class fighters. Even Chavista supporters internationally would admit that the party created by Hugo Chavez, the United Socialist Party of Venezuela (PSUV), was not conceived as a Marxist organisation. The Bolivarian Revolution itself was never a socialist revolution. This is something that genuine Chavista supporters in Venezuela and internationally have to face up to. Socialism begins with the working class creating its own power, overthrowing the rule of capital, and taking control of the major means of production, at least initially. None of this has been attempted in Venezuela – in fact, quite the opposite. Despite some abandoned factories being taken over by the government here and there, the major means of production remain in private hands in Venezuela. The entire banking system remains in the hands of the wealthy elite. Far from organising working class occupations and take-overs of critical public infrastructure, the Chavistas have restricted their political work largely to elections. Because the state remains in the hands of capital, all of the gains made by the Bolivarian Revolution can therefore be taken away by a lost election. This reality is getting closer day by day. In fact, a US backed military intervention, or even just a classical Wall Street backed “opposition” movement creating enough chaos to topple the government, is on the cards. An actual socialist revolution enables the most advanced workers to destroy the capitalist state, and erect a workers’ state in its place, as the first step towards the transition to socialism. The critical factor is that the working class uses state power to win the majority of the working people, and integrates them into ruling the new society themselves – without and against the corporations and their wealthy backers. The Bolivarian Revolution, on the other hand, attempts to rule in the name of the “people” or “Venezuelans”. In a class divided society, however, uniting antagonistic classes is an impossibility. And so, without working class control of the banks especially, there is no chance of being able to control such things as runaway inflation. This is one reason why the right-wing opposition is able to make a comeback. The PSUV and Maduro constantly enter into negotiations with Venezuelan capitalists and the opposition generally, in a vain attempt to somehow make enough concessions that might lead them to refrain from sabotaging the economy and the state. A genuine socialist leadership of a workers’ state would enter into negotiations with former capitalists who have been deprived of political power – but Maduro and the Chavistas do not lead a workers’ state, and they have no intention of expropriating even some of them. Their negotiations are based on the fantasy that Venezuelan business owners would somehow value all Venezuelans above their material wealth. But the opposition’s open consorting with and through Washington and all of their agents is a clear indication that the Venezuelan “captains of industry” are only loyal to the profits they can squeeze out of Venezuelan workers and the poor. The Venezuelan rich classes are also part of the reason why there is a migration crisis between Venezuela and Colombia, and elsewhere. The hoarding of goods by businesses that refuse to sell or supply them to poor Venezuelans causes some to pack up their belongings and seek asylum where food and goods, not to speak of work, are available. Hyper-inflation, now barely measurable, pushes prices of basic goods out of reach. Some reports state that as many as 10 to 12%, or around 3.8 million, Venezuelans now live abroad in more than 90 countries. Many of them flee Venezuela on foot, and large numbers of them cross the border into Colombia. Some move further through Ecuador and into Chile. At the same time, the hypocrisy of the Colombian government blaming Venezuela entirely for this migration crisis stands out in stark relief. 50 years of war in Colombia, with right-wing paramilitaries regularly murdering left-wing guerrillas and perceived supporters has led to millions of Colombians fleeing for their lives. Venezuela has reportedly absorbed about 30% of this migration, with an estimated 5.6 million Colombians living in Venezuela, according to 2015 figures. What is more, these Colombians benefit from the same rights as all Venezuelans, and make use of the government provided health care, education and housing! The Venezuelan oil industry, the exports of which make up around 95% of government earnings, is now at its lowest level in 70 years. Crude oil production is currently down to around 1.4 million barres per day (mbpd), which is about half of the average 2.4 mbpd Venezuela usually produces. It had a record high of 3.4 mbpd in 1997, and a record low of 0.594 mbpd in January 2003, during the opposition “oil lockout”. The People’s Republic of China (PRC) is a major recipient of Venezuelan oil, but due to the problems PDVSA is experiencing, it is struggling to send its shipments. In July, the China Development Bank approved a $250 million grant to PDVSA to boost oil production. This is on top of a $5 billion loan already approved, which exists alongside previous $50 billion oil-for-loan arrangements with the Asian economic powerhouse. Workers should be clear – this assistance from the PRC stems from the predominantly socialist state led Chinese economy, of which its state owned oil production forms a part. Without the PRC’s largely collectivised and planned economy, based on public ownership of the major means of production, Red China would not be the world’s leading economic generator today. While the economic assistance the PRC is able to grant Venezuela acts as a welcome countervailing factor to the threats of regime change emanating from the US Empire, it may not be enough to stave off the relentless sabotage the Venezuelan right wing opposition utilises, in concert with Washington. While the PRC’s assistance to Venezuela is welcome, the politics of the Communist Party of China (CPC) leadership is such that it does so in order to prop up the Venezuelan bourgeois system, rather than “socialism”. If the PRC was led by genuine Marxist internationalists, the assistance would be provided alongside political encouragement to raise the working class to power, in Venezuela and Latin America. The working class internationally is crying out for leadership, as capitalism drives human society ever closer to an abyss. There is scarcely any leadership coming from the left in the Western imperialist countries. The leaderships of the countries which broke from capitalism after World War II maintain their initial success in establishing the first steps towards socialism. In the PRC, the largely nationalised and planned economy guided by socialist state led development continues to outstrip the US, Europe, Japan and Australia. Yet the PRC leadership, along with their cohorts in Vietnam, Laos, the DPRK (“North Korea”) and Cuba concentrate their building of socialism within their own borders. Unfortunately, workers do not hear calls from them to join with them in a struggle to finally end global capitalist rule. Neither, however, do such calls emanate from Chavismo. The movement led by Chavez and now Maduro has won substantial gains for the working class and the poor in Venezuela. Yet every reform made via electoral change, even one which has governmental power, can be taken away by capital as soon as the political conditions allow. The only way to not only protect the free health care, education, housing and other gains won by Chavismo, is to prepare the workers for the overthrow of corporate rule, via the destruction of the old regime based on vast inequality, and the construction of their own state. Unless the working class holds power, socialism only lives in words. Workers in Venezuela have the task of winning over Chavistas to the perspective of a genuine struggle for the arming of their class and the rule of a workers government. Key to this is the forging of an internationalist Marxist cadre party. Workers internationally have the task of defending Venezuela against the dire threat of open imperialist intervention from the US Empire. There is a need for the military defence of the Venezuelan government against US imperialism, while preparing the political conditions for the supersession of Chavismo with a perspective of united action between the workers of Venezuela, Colombia, Latin America, the US and internationally. 19-10-2018 – As if the Australian government could not be any more craven to the masters of the US Empire, Liberal Party Prime Minister Scott Morrison this week publicly floated the idea that his government would follow the lead of the US Donald Trump administration and move its embassy from the Israeli capital Tel Aviv to Jerusalem. This would also entail recognising Jerusalem as the capital of Israel. 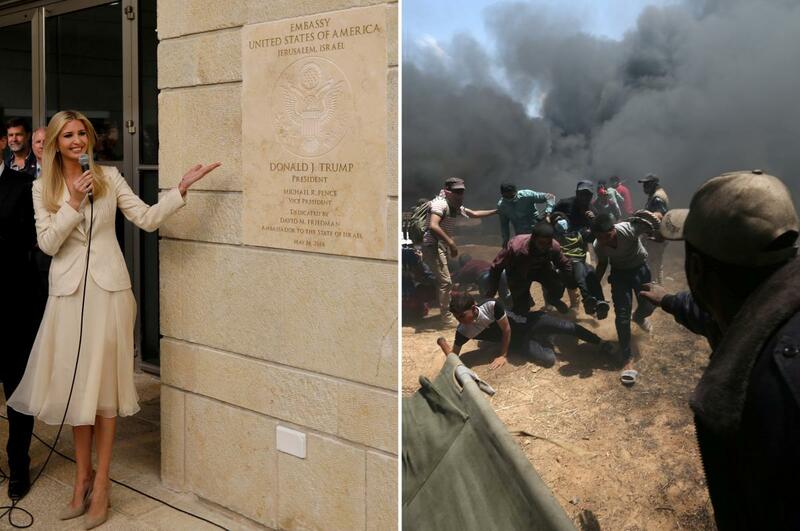 The opening of the US embassy in Jerusalem in May this year was birthed with the blood of 58 Palestinians who were shot dead by the Israeli Defence Force, who were apparently given orders of shoot to kill to prevent a protest march in Gaza from breaching the border. Around 2000 were also wounded, after being hit by live-fire bullets. One wonders if the Australian government was hoping for a similar massacre to christen the opening of its embassy in Jerusalem. Some speculation has it that Prime Minister Morrison’s thought bubble was a desperate ploy to secure votes ahead of the coming by-election in the seat of Wentworth, vacated by dumped former PM Malcolm Turnbull. The Liberal Party’s candidate, Dave Sharma, is a former Ambassador to Israel. This may well have been part of the reason, but world geo-politics following the US Empire’s war on Syria plays the dominant hand. From 2011 onwards, the US Empire waged arguably the most atrocious proxy war in history upon the Syrian Arab Republic, in a not so subtle war of regime change. The plans of the US ruling class for regime change in Syria did not by any means begin in 2011, but go way back to at least the 1980s. But this time, the US government, which has routinely overthrown states in Latin America, the Middle East, Africa and Asia over 70 years, was stopped in its tracks. Incredible heroism was shown by the Syrian Arab Army, and they were joined by the resistance fighters of the Lebanese Hezbollah and Iranian armed forces. Decisive, though, was the intervention of Russia, which followed through on a request from the Syrian government. Russia’s far superior air power dealt crippling blows to ISIS, Al Qaeda and all of the mercenary death squads which had been armed, trained, funded or otherwise assisted by, at least, the governments of the US, the UK, France, Saudi Arabia, Turkey, Qatar, Canada, Denmark and Australia. Recently, the Israeli government finally admitted that it too had armed the anti-government barbarians in Syria. Donald Trump was partially elected as President on the promise that the US would no longer be involved in the regime change wars, such as those in Libya and Syria. Despite fury from the CIA Democrats, Trump has more or less wound up former President Obama’s regime change plans for Syria. But the writing was well and truly on the wall in any case – Russia effectively liberated Syria from ISIS. Many supporters of Palestine, and some left parties, ply the Boycott, Divestment and Sanctions (BDS) campaign in their efforts to end the suffering of Palestinians. Yet PM Morrison’s actions this week should serve as a warning sign as to how misguided are nonetheless well intentioned BDS supporters. The “Sanctions” part of BDS calls on national governments to apply sanctions on Israel until some of the just demands of the Palestinians are met. Working people should not be attempting to win over the same governments that have recently committed the outrageous provocation of shifting embassies to Jerusalem, to the cause of Palestinian liberation. These governments are part and parcel of states which are class enemies of working people, and oppressed nationalities such as Palestine. They cannot be won over because they are an integral cog of capitalist imperialism. Any attempt to win them over feeds the already vast illusions that no matter what “mistakes” these governments make, at the end of the day they are “our” representatives. Little could be further from the truth. The governments that the BDS movement wills to apply sanctions on Israel are the very same ones which uphold the Zionist Israeli state. This contradiction comes about because often the nationalism of the oppressed nation can only really be recognised by the powerful (imperialist) nations. BDS is ultimately one wing of Palestinian nationalism. Others include the nationalism of the almost universally rejected Palestinian Authority, which functions as little more than a Zionist/US deputy policing Palestinians. Another is the Islamist nationalism of Hamas, which treacherously backed the overthrow of neighbouring Syria by sectarian cutthroats armed by the West, as well as the Israeli government. Any nationalism trapped within the framework of capitalism will not be able to solve its first tasks. Palestine can only be freed alongside the millions strong Israeli working class – the overwhelming majority of whom do not at all back the Zionist policies of predatory aggression towards the Palestinians. What is required is to unite Palestinian and Israeli workers through the struggle for a bi-national Arab/Hebrew workers state. In other words, the just cause of the national rights of the Palestinians can only be finally won through a victorious socialist revolution. Even before such a revolution is won, working people internationally who defend Palestine can only be effective in doing so by consistently and stridently opposing all facets of imperialism – not by seeking to work with it, as per the BDS campaign. This means opposing all wars being waged or being threatened by the Zionist Israeli state’s guarantor – the US. War against Syria, Iran, Russia, China, the DPRK (Democratic People’s Republic of Korea), Venezuela – all of these must be opposed with equal vigour – if one is to be genuine about the liberation of Palestine. Key to this outlook is the forging of Marxist vanguard parties, which seek to light the way from the horrors of war to the beacon of socialism. 05-10-2018 – The people of the Philippines today are suffering under a tyrannical fascist dictator who terrorises and murders anyone who opposes him – or so the story goes. Who tells this story? Filipino workers enduring a loss of political rights? Filipino trade Unionists having their organisations dispersed by armed gangs? Left-wing anti-war activists? Hardly. The portrayal of Philippine President Rodrigo (“Rody”) Duterte as a “fascist” is spun most of all by a slew of US backed NGOs, many of whom are inevitably linked to the notorious CIA front the NED (National Endowment for Democracy). Under the 1987 compromise Philippine constitution brought in after the movement against then President Ferdinand Marcos, NGOs were given outrageous entitlements, and even a tax exempt status under Section 30 of the National Internal Revenue Code. As a consequence, the number of NGOs operating in the Philippines are estimated to number up to 100 000. Today, the activities of a list of them are reduced to fomenting conservative opposition to the administration of President Duterte, who was elected in 2016. The overwhelming majority of the Filipino people, however, certainly do not share Western angst towards their President. Quite the contrary. 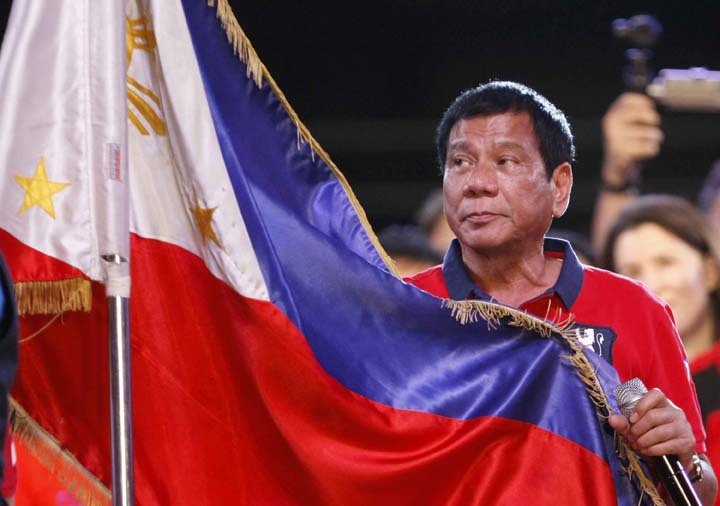 Rodrigo Duterte is, by far, the most popular President in Philippine history, and his sky-high approval rating has remained above 80% virtually since his election. While there is a history of high approval ratings for Presidents in the Philippines, which some say results from a somewhat deferential Filipino culture, Duterte’s approval ratings have officially been significantly higher than any other government since approval ratings first were collected in the 1980s. A recent poll put Duterte’s approval rating at a staggering 88%, which is only marginally down from the 91% approval rating he gained on the assumption of the Presidency after the 2016 election. What is it about Duterte in particular which produces such jolting statistics? An answer to this question must cover several aspects. Firstly, Rodrigo Duterte is not seen as one of the “trapos” (traditional politicians) that the Filipino people have endured for decades. The former mayor of Davao is genuinely seen as a man of the people, as one of them. He is certainly an outsider, and not at all one of the millionaire Manila elite, like many of his predecessors. He reportedly doesn’t wear socks, doesn’t know how to tie a necktie, and lives in a modest house rather than a mansion. While he likes fast cars, there are few signs that he cares about making money. While corruption has played a huge role in the downfall of previous Presidents from Marcos to Estrada to Arroyo, Duterte is thus far untouched by this, and, given his apparent lack of interest in living a high life, it doesn’t seem that he will be tempted into it either. In a country with a history of sell-out politicians, Duterte is largely seen as a rebel with a cause. No wonder Washington was alarmed !! It’s the worst nightmare for a US Empire which is in decline economically, politically and diplomatically. President Duterte’s bravery and boldness, expressed with trademark irreverence, is a refreshing relief for many Filipinos, one quarter of whom live from hand to mouth. The Philippines was meant to be cornerstone of Washington’s attempts to “contain and roll back communism” in the form of Red China. Yet Duterte’s brash-sounding statements above also reflect a reality which the Filipino ruling class is realising, along with other countries in Asia – the US no longer has the economic or political resources to dominate large sections of the planet. It is being overtaken by the gargantuan state-led economic power of socialist China, which has the financial resources to offer mutually beneficial development. The People’s Republic of China (PRC), as a non-capitalist power, does not seek to exploit and plunder neighbours and other countries in the manner that we are familiar with from the US, Great Britain and France historically in the Asia-Pacific. Filipino sovereignty is vitally important, in a country which has been dominated for over 100 years by Spanish and US colonialism. To prosecute sovereignty, President Duterte has indicated that he has an obligation to look outside the traditional power of the US and its Western adjuncts. At the APEC (Asia Pacific Economic Co-Operation) summit in 2017, Duterte met several times with Russian President Vladimir Putin. Russia donated thousands of automatic rifles, 20 trucks and helmets to the Philippines, to assist its anti-terrorist operations in Marawi. Putin stated that Russia and the Philippines has a common enemy in the fight against terrorism. In response Duterte stated that the Philippines will remember Russia for all time. One can almost hear the jaws dropping in the Pentagon. The US in Syria suffered arguably its first defeat in war since Vietnam, once Russia somewhat belatedly intervened, at the request of the Syrian government, in 2015. Russia, with its superior military air power, outplayed the US politically. They openly called for the US to join it in a fight against the terrorist death squads in Syria. The US could not intervene on the side of its Al Qaeda and ISIS patrons, and thus was forced to sit back while Syria, Russia, Iran and Hezbollah went on to expel the deranged mercenaries. It was a humiliating defeat for the US, the UK, France, Saudi Arabia, Israel and others including the Australian government, who had been expending resources in a desperate attempt at regime change. President Duterte, along with a whole host of other countries not involved, no doubt noticed how the Russians outfoxed the US, politically as well as militarily. Duterte is not the only leader from a developing country who can see the military rise of Russia, which complements the economic rise of China. Many progressive minded folk throw up their hands in horror when hearing of President Duterte’s war on drugs – especially as “war” is not used by Duterte as a metaphor. Yet it is not as if Filipino drug dealers were not warned. Duterte explicitly made the case that drug addiction is a major problem; other methods used in the past have not worked, so his administration will take matters into its own hands in dealing with drug king-pins. “You destroy our country, I’ll kill you…you destroy our children, I’ll kill you..” Duterte proclaimed as he began his Presidency. Like this approach or loathe it, it has the support of the overwhelming majority of Filipinos. They agree with Duterte that around 4 million drug users who remain addicts for years represent a significant social problem. Despite the wailing from US linked NGOs, thousands of drug addicts have reportedly surrendered and asked for treatment. The case of the innocuous sounding Sister Patricia Fox, from Australia, is another issue which tends to alarm those with generally liberal political inclinations. Sister Fox is a 71 year old Catholic Nun who has headed up an order in the Philippines for the past 27 years. While her work and the work of her order has primarily been based on assisting the many poor, in recent years she became involved in anti-government political actions and movements. In response the Duterte administration has sought to deport her. Yet this is not a case of a unilateral quashing of dissent, for Filipino law forbids foreigners from being involved in domestic Filipino politics. Regardless of the motivations of Sister Fox, by seeking her deportation, the Duterte administration is only applying Filipino law. In a similar vein, there is also a law against foreigners owning outlets of the Filipino press. The “Rappler” news site has been criticised by Duterte as being US funded. And, despite repeated attempts to deny US funding, Rappler has been shown to be partially funded by the Omidyar Network, set up by Ebay founder and entrepreneur Pierre Omidyar and his wife Pam. As if this was not obvious enough, Rappler is headed by Maria Ressa, who has spent the past 18 years as the bureau chief for the notorious CNN in both Jakarta and Manila. Applying Filipino law, there is a case against Rappler by the Duterte administration making its way through the courts. The Catholic Church is deeply ingrained in the Philippines, and yet the popularity of President Duterte is such that he can openly question some of its public positions. For example, Duterte has stated that he will assist a movement in the Philippines which sought to legalise LBGTIQ marriage. This is seemingly at odds with his tough guy image, and it is a stance which is conveniently ignored by his liberal critics. If the Communist Party of the Philippines (CPP) spruiks its opposition to President Duterte, this must mean that this is the view of the left – some would assume. In reality, the CPP and its off shoots such as the New People’s Army (NPA) and the NDFP (National Democratic Front of the Philippines), in practice join with the other ranks of liberal outrage – many of whom are linked to the bevy of US backed NGOs. For example, the NDFP strongly criticised President Duterte’s declaration of martial law in Mindanao in May 2017, drawing comparisons to the martial law period in the 1980s under Ferdinand Marcos. Yet the declaration of martial law was made to enable military operations against ISIS !! ISIS appeared out of nowhere when President Duterte was in Russia signing trade and other agreements with President Vladimir Putin. It is not unreasonable to suggest that the US pulled the strings on the ISIS marionette in response. Moreover, President Duterte’s military operations against ISIS were overwhelmingly popular amongst Filipinos, as many of his other moves are. A sign of this was the unqualified support for the martial law declaration from world champion Filipino boxing icon Manny Pacquiao, who is also an elected senator. Pacquiao, regarded as a national hero for his boxing feats, said the country should be grateful for the strong leadership of President Duterte. The CPP/NPA has been waging a 50 year guerrilla war against the Filipino government, which flows from the Maoist theory of “protracted people’s war”. This sounds impressive, but in doing so the politics of Maoism outside the state where it achieved state power (China), means it constantly seeks allies amongst classes other than, and opposed to, the interests of the working class. It imagines that somehow, the capitalists, small proprietors and workers can put aside their class interests and form a bloc which will achieve a “national democracy”. This is of course impossible – there has never, and can never, exist a “democracy” across mutually antagonistic classes. All attempts in this direction will thus ultimately fail, and the politics of those prosecuting this strategy can never rise above base level reformism. Rather than a fruitless struggle for cross class “democracy” in the Philippines, Marxists need to seek to organise and lead the working class in its struggle for the overthrow of capital. Rather than join the swamp of US backed opposition to Duterte, revolutionary minded workers need to recruit to their own banner while engaging in a temporary bloc with the Duterte administration against the encroachment of US imperialism and its intermediaries in NGOs and left-populist parties. The leadership of a Leninist vanguard party is the missing ingredient to the real revolution needed in the Philippines. 05-09-2018 – If genuine anti-war activists have learnt anything over the last few decades, it is to be supremely skeptical the moment the US Empire and its corporate media apparatchiks start to chant in unison on the latest “human rights” violation which urgently needs attention. It usually means that a “humanitarian intervention”, read – regime change war, is on the way. So it was in Libya, so it was in Syria, and so may be in Myanmar. Some of the actors are the same, some are different, but the effect is familiar – the West poses as the defender of civilisation against Third World barbarians. The hypocrisy becomes immediately apparent to anti-imperialists, but deludes many who should know better. One year on from the alleged genocide of Rohingya Muslims in the Rakhine state of Myanmar, there has been a round of demonstrations called by some ex-pat Rohingya community groups throughout Australia, which have been backed by liberal political forces and “NGOs” such as Amnesty International. Some misguided left parties have joined the fray. And this time, these actions have the backing of none other than the Donald Trump administration of the US government ! The US government has seen fit to sanction several Myanmar military commanders for allegations of ethnic cleansing, massacres, sexual assaults and extra-judicial killings. It takes one to know one. The US Empire, with its blood drenched history, is itself an exponent of the crimes of which it accuses others. What happened in the Rakhine state in August 2017? A report released several weeks ago in London, titled Forced Migration of Rohingya: The Untold Experience, claimed that from August 25, 2017, around 24 000 Rohingya were killed, and 18 000 Rohingya women and girls were raped during the forced migration from the Rakhine state into Bangladesh. The report claims, amongst other things, that 43 000 Rohingyas were shot, 36 000 were thrown into fire, and 116 000 were beaten – all at the hands of the Tatmadaw (Myanmar military). The writers of the report were from Australia, Bangladesh, Canada, the Philippines and Norway. The absence of anyone from Myanmar immediately raises suspicion. And, given that for the last seven years at least, the West’s war on Syria was replete with incessant claims from the West that the Syrian government was slaughtering its own civilians wholesale, and given that this turned out to be abject lies – we are entitled to smell a rat. Generally, people do not flee from their homes and attempt to enter a neighbouring country without fearing for their lives, and it seems the estimated 700 000 Rohingya who took flight certainly were motivated by fear. But fear of what, and of whom? The West claims, over and over again, that the Rohingya were fleeing from Myanmar’s army. For them, this is a convenient narrative. In reality, the Rohingya were fleeing from the threatened or actual extreme violence from two sources, neither of which were the armed forces of Myanmar. The first were the ultra-violent and ultra-racist Buddhist “monks”, who were the key protagonists of the “Saffron Revolution” which brought Aung Sung Suu Kyi into government. These “monks” had been whipping up lethal hatred against Rohingya Muslims for years before 2017, which is why there was already Rohingya refugees fleeing Myanmar. The “monks” are the key support base of Aung Sung Suu Kyi, and of her party, the National League for Democracy – which has in turn been almost wholly funded by the governments of the United States, the United Kingdom, and billionaire regime change specialist George Soros. These openly imperialist forces knowingly do this despite the leading figure of the “monks” being Ashin Wirathu, known as the “Burmese Bin Laden”. Reportedly in response to a question over whether he was the Burmese (Burma is the previous name for the country of Myanmar) Bin Laden, Wirathu said he would not deny it. Fuelling ultra-nationalism, Wirathu has incited and led what are effectively racio-religious purges of Rohingya in Myanmar for years. Yet there are no headlines about Buddhist monks driving Rohingya into the seas. The second force the Rohingya were also fleeing was the Arakan Rohingya Salvation Army, or ARSA. Why would a so-called liberation army containing the name “Rohingya” actually turn their guns and swords against Rohingya people themselves? For the same reason that ISIS, with Western governmental funding, gruesomely slaughtered other Muslims (and Christians and other “apostates”) in Syria. That is, ARSA does not represent Rohingya people any more than ISIS represents Muslims. ARSA was originally Harakat Al Yaqin (the “Faith” movement), with many of its fighters having been trained in Pakistan by the notorious Lashkar E-Taiba (LET). Some Rohingya have been jihadists running with Al Qaeda in Afghanistan, Chechnya and the Middle East, and have now been encouraged to return to Myanmar to continue an insurgency with the aim of an Islamic state. It should be stressed that only some Rohingya join terrorist groups such as ARSA, but the precarious state of the Rohingya given their mistreatment at the hands of ultra-nationalists tends to lead to a situation where young Rohingya men might be persuaded to take up arms in response. The act which precipitated the armed response from the Tatmadaw was a series of pre-dawn armed attacks by ARSA on 30 police stations, which took the lives of some 13 police officers, and seems to have been also used to gather weapons. These pre-emptive murderous assaults took place just two days after United Nations (UN) special representative Kofi Annan issued his report on the Myanmar government’s actions towards the Rohingya. Firstly, it is just too convenient for the proximity of these two actions for it to have been a coincidence. Secondly, if armed attacks by jihadists on police stations sounds familiar, it is because such attacks also took place in Syria, by Western backed terrorists looking to ignite their gruesome insurgency against the Syrian Arab Republic – which was almost universally rejected by Syrians. Just as the Syrian government had little option to respond to an armed attack by terrorists on its infrastructure, the Tatmadaw likewise had no choice but to militarily respond to a terrorist attack on their state. Thus, the Rohingya who fled were fleeing fighting between the terrorist ARSA and the Tatmadaw, NOT the Tatmadaw only, as Western misled refugee rights activists claim. During the US led war on Syria, imperialism learnt how to skillfully manipulate human sympathy for refugees for its own ends. This has now been replicated in Myanmar in the case of the Rohingya. Most first world refugee rights activists, although motivated by wholesome concerns, unfortunately end up stumping for the very force which creates refugees in the first place. Imperialism with its vast corporate media apparatus can spin the story to fit their aims, but left-leaning activists should have been aware that something was up when tabloid former 60 minutes reporter Ray Martin pops up out of nowhere to fly the flag. In April, Ray Martin visited Myanmar and returned a shallow report on the work of the Fred Hollows Foundation who were assisting Rohingya with eye operations. Working people of course should not oppose aid offered for any refugees, but the propaganda point was clear – Rohingyas are suffering at the hands of the evil Myanmar government, and “we” (read: Washington and Canberra) need to “help”. Of course, the “help” the US Empire is itching to offer is that of sending in its own troops into Myanmar, so as to eventually have troops on the border with the People’s Republic of China (PRC). If it is not able to do this, armed proxy terrorist forces such as ARSA will do for the time being. The chaos and insurgency of terrorist groups in Myanmar can also only benefit Washington, who is seeking to disrupt the growing trade and investment ties between Myanmar and Red China. Washington is furious at this, as China becomes more and more an ally to more and more countries in Asia. In the first eight months of the current financial year, trade between Myanmar and China totaled 7.42 billion in US dollars. Myanmar’s rice, peas, sesame seeds, rubber and fishery products were exchanged for machinery, plastic raw materials and electronic devices from China. Indeed, Myanmar is a part of the billion dollar New Silk Road (One Belt One Road) infrastructure development plan the Chinese government seeks to enact in order to fulfil its demand for more raw materials to fuel its booming socialist economy, AND economically aid surrounding developing countries. While not minimising the issues the Rohingya face in Myanmar, Western liberals are almost universally unaware of the role of US and British imperialism inside the country over many decades. Their active empathy is then manipulated by the different arms of Western capital, to further ends which will in effect make things worse for the very people they aim to assist. For example, the notorious National Endowment for Democracy (NED), a US State department entity which claims to be a private entity, is funded by corporations that could hardly be described as “progressive”, including Boeing, the Ford Motor Company, McDonalds, Exxon Mobil and Goldman Sachs. The NED has literally created putative “news outlets” in Myanmar such as The Irrawaddy, The New Era Journal and the Democratic Voice of Burma radio. 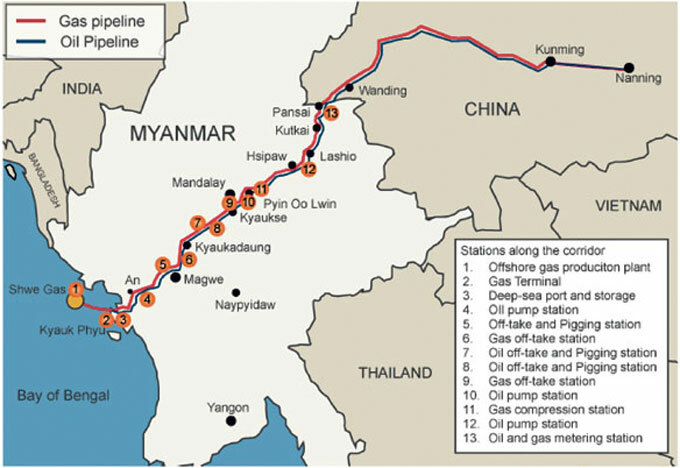 These US state backed outlets operating inside Myanmar strongly oppose many infrastructure projects being built with the assistance of China, even if such projects would contribute to the development of Myanmar and the alleviation of pockets of poverty. They then double as “refugee rights activists” when issues such as the situation in the Rakhine state arise. It is no coincidence that China operates a port in Sittwe in the Rakhine state, as a part of the New Silk Road project linking China, Myanmar and Bangladesh. Myanmar should not be left in a state of underdevelopment just to spite Red China. While not doubting the genuinely humanistic motives of many Western refugee rights activists, their reform oriented politics makes them vulnerable to playing the role of cat’s paw for the aims of the US Empire. For decades, the US state has aimed to land US troops on the border with Red China. Now, with the socialist state led economy of China leaving the West in its wake, imperialism is desperate to “contain and roll back communism” to use a phrase from the first Cold War. This means military encirclement of China, and the constant attempts to establish areas which can be used as a stepping stone, or lily pad, for US forces. In Myanmar, this means using any means at its disposal to create chaos, ethnic conflict and even full scale war. As in Syria, the US and the UK governments will work with and alongside Al Qaeda linked jihadists aiming for a breakaway “Islamic State” – which, if achieved, would be an ideal location for a US military installation. This is what is behind some calls for an “independent” Rohingyan ethno-state. Some Australian left parties have fallen hook, line and sinker for the US/UK orchestrated “Save the Rohingya” psy-op. Socialist Alternative whitewash ARSA’s links to Al Qaeda, by claiming that ARSA is little more than a “poorly armed group of Rohingyas seeking to resist displacement from their land”. In reality, ARSA is well funded and armed from amongst the governments of Saudi Arabia, Malaysia and Pakistan. ARSA even reportedly has a leadership council based in Saudi Arabia. The Socialist Alliance appears blind even to the role of ARSA, and last year called on the Australian government (!) to “bring charges of human rights violations against senior Myanmar military officials…..” (!!) The Australian government, fresh from human rights violations in wars such as those on Iraq, Afghanistan and Syria, is hardly a temple of virtue on this front. Moreover, as mentioned previously, the Donald Trump administration in the US has done just this, sanctioning some Tatmadaw personnel over allegations of ethnic cleansing. When the Commander in Chief of US imperialism effectively carries out your demands, it should at least be apparent that your politics is off-beam. Meanwhile, both Solidarity and the Communist Party of Australia join with the US state department in condemning Myanmar for allegations of “ethnic cleansing”. One wonders if they are aware of the company they keep. If it is genuinely the aim to assist the Rohingya’s integration into Myanmar, working people need to demand the withdrawal of US and UK government interference in its internal affairs. Myanmar must have the sovereign right to engage in trade and investment deals with whomever they choose, including Red China and its New Silk Road. While the politics of the leadership of the PRC falls way short of a struggle for international revolution, China must be defended, along with the working class internationally, against the West’s moves to ignite a predatory war. Our lives may just depend on it.